Like most of you, we’re continuing our work, while witnessing the heartbreak of the many devasted Americans around the Gulf Coast. We’ll suspend posts for a few days while trying to take it all in. Please donate. Please volunteer. Please pray. Joseph Holt, Alex Kirwan, Rob Renzetti. We’ve just added 17 stunning second season images to the My Life as a Teenage Robot Title Card Gallery, in addition to the 31 already there from Season 1. As many of you know, I’m a bit crazy for title cards; the vintage Hanna-Barbera cards are some of the favorites in my animation art collection. It’s been a fixation of mine to make sure the productions I’ve been involved with pay special attention to design the neatest cards they can muster. Rob Renzetti, an alumnus of Oh Yeah! Cartoons and creator of MLaaTR, needs no pushing on the subject of exemplary graphic design, as any Robot fan can attest. His first move on the series was bringing on the extraordinary Alex Kirwan (himself an Oh Yeah! creator). In turn, they asked Joseph Holt to become the show’s background designer, giving him responsiblity for the title cards as well. As you can see, Alex’s 30s-ish vision for the show played itself out beautifully in Joseph’s pitch perfect, contemporary Deco electronic paintings. Blog History of Oh Yeah! Cartoons. Part 4. Blog History of Oh Yeah! Cartoons. Part 1. Part 2. I am admiring of how Nickelodeon went about interpreting our suggestions for getting into the original cartoon business in the late 80s. They listened respectfully to our approach to go back-to-the-future of cartoon creation to model their entry on Looney Tunes. That is, make a single, short cartoon, with highly talented and skilled filmmakers, show it to the audience, and, if they like it, make more. So, as the best clients often do, they took what they wanted from that advice, and did it their way. And their way worked like crazy. Nick’s head of development & production (now Chairman) Herb Scannell enlisted the help of Vanessa Coffey and Mary Harrington, two cartoon novices (though with oodles more experience than Herb, or me for that matter). Herb, Vanessa, and Mary identified five indie studios to make pilots: John K’s Spumco, Klasky-Csupo, Jim Jinkin’s Jumbo, Joey Ahlbum, and I don’t remember the fifth. The results made animation history, and changed the game in TV animation forever: Ren & Stimpy, Rugrats, and Doug, all from Nickelodeon’s initial foray into original cartoons. Last night Nextoons: The Nicktoons Festival launched its second season on the Nicktoons digital cable network. This year there are 8 screenings (more than 50 films) playing at midnight throughout the week. The winners, picked by our stellar panel of judges, will be announced Sunday, August 28 at midnight (or Monday, August 29, depending on how one looks at it). A neat new feature of the festival this season is the Viewer’s Choice Award, picked by guess who. Check it at the website to cast your vote. As soon as I get the complete download, I’ll post the goodies that were in the swag bag that each of this year’s filmmakers got. Maybe that’ll spur you on to complete your picture in time for next year’s festival. Gordon Hammond has won the Emmy for Individual Achievement in Animation for his character design on Shelf Life, an episode of Butch Hartman’s The Fairly Oddparents on Nickelodeon. We are thrilled and amazed to have another of our Frederator colleagues win this prestigious prize (Seonna Hong won last year for her work on My Life as a Teenage Robot.) And, as many of you know, The Fairly Oddparents was one of the original 39 shorts in the first season of Oh Yeah! Cartoons. The best part of my day is finding something exciting. It’s even more fun when my colleagues are on the phone saying how thrilled they are about a project. That happened today when Eric Homan called me today to tell me about an Oh Yeah! pitch from Doug TenNapel, the creator of Nickelodeon’s CatScratch and Earthworm Jim. 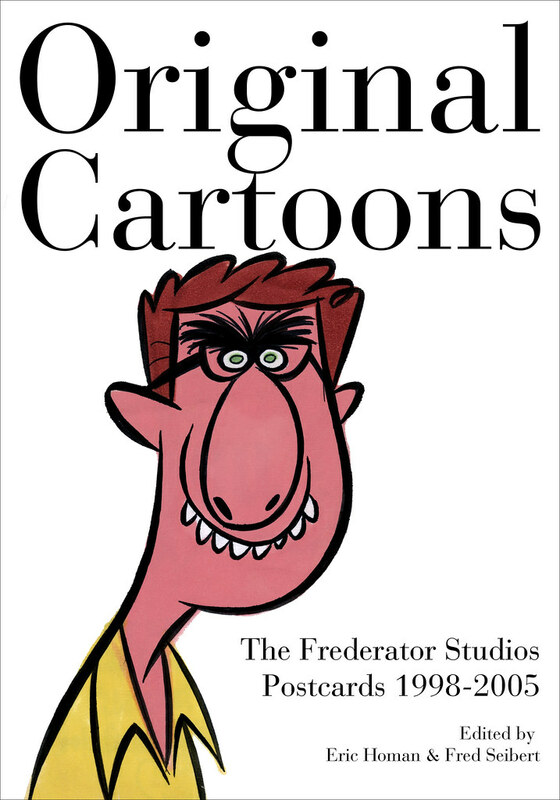 We’re very excited to have received the pre-publication copies of our first official Frederator book (co-edited with Eric Homan and published by the Easton Studio Press), the collection of postcard series’ we’ve been sending out since 1998. (Also included, essays and interviews by Jerry Beck, Steven Heller, and Joe Strike). Even though the official release date is November 30, we’re going to pre-sell copies directly from our site starting in September. (Along with a special, very rare and limited box set of all the original postcards.) Or you can pre-order directly from Amazon.com. In the meantime, you can download a PDF of the book for your previewing pleasure. Floyd Bishop owns Bishop Animation in Carbondale, Pennsylvania, “a full service animation studio, specializing in high end computer animation.” After reading about the studio on Cartoon Brew, we asked Floyd to come by and talk with us about Oh Yeah! Cartoons. After showing us the studio reel and some concept drawings earlier in the summer, today Floyd and Veronica Harper came by to show us Lost & Pound. Here’s a download of a CGI motion test they brought of one of their characters. Thanks to Floyd for his kind permission to post some of his pitch. Thanks to Joe for his kind permission to post some of his storyboard pitch to Oh Yeah! Cartoons. Next week Nicktoons premieres its second Annual film festival, Nextoons, each night August 21-28, Midnight (ET)/9:00 p.m. (PT). Created in partnership with Frederator Studios, Nextoons showcases the diversity of independent cartoon filmmaking by animators from around the globe. Fred Seibert, Rita Street and Eric Homan are the Festival Directors, and Christina Vann of Nicktoons is Executive in Charge of Production. The panel of Grand Jurors for the Nicktoons Film Festival responsible for selecting the $10,000 Grand Prize winner includes: Mark Hamill (Luke Skywalker); Michael Dante DiMartino and Bryan Konietzko (co-creators of Nickelodeon’s hit show Avatar), Mike Gabriel (Disneys’ Lorenzo), Elizabeth Ito (last year’s Nextoons winner) and ten-year-old Noah Webb, a cartoon connoisseur.